You know by now that Instagram can be a powerful tool to leverage when it comes to marketing your brand and engaging your followers. But, there’s yet another question that you’re eager to get an answer to: Is an Instagram business profile worth it? Should you go through the process to get your brand’s account identified as a business? Or, is it better to save yourself the trouble and just leave things the way they are? Does it really make a difference? Those are all great questions—and, admittedly, there are a few Instagram business profile cons, as well as pros when it comes to deciding whether or not you’re better off with a business account or not. So, today, we’re going to explore the benefits and the Instagram business profile cons with making the switch. By the end of this post, you should have some clarity on what the best way forward is for you and your own brand. Put simply, an Instagram business profile is a type of account that makes it easy for your followers to recognize your Instagram feed as that of a business—rather than an individual. Similarly to how you’d look for a blue checkmark to identify a verified account, the fastest way to tell whether or not a specific Instagram account is set up as a business profile is to look at the bio. If you see any buttons that give you the option to contact the company directly there (such as “call” or “email”), that particular brand is using a business profile. In addition to making it simple for followers to get in touch, the business profile has a few other features that you won’t find with a standard Instagram account. We’ll dive into those more in the “pros” section below before pointing out one of the major Instagram business profile cons. How Do You Switch to an Instagram Business Profile? You’ll be walked through a few prompts—such as choosing your business Facebook page and entering your contact information—before the switch is complete. Want more information about making the switch? This video from Instagram will take you through the process step-by-step. Now that you’ve got the basics down pat, it’s time to weigh your options and decide whether or not an Instagram business profile would be the right move for your brand. Much like any other marketing activity, people have strong opinions about this. 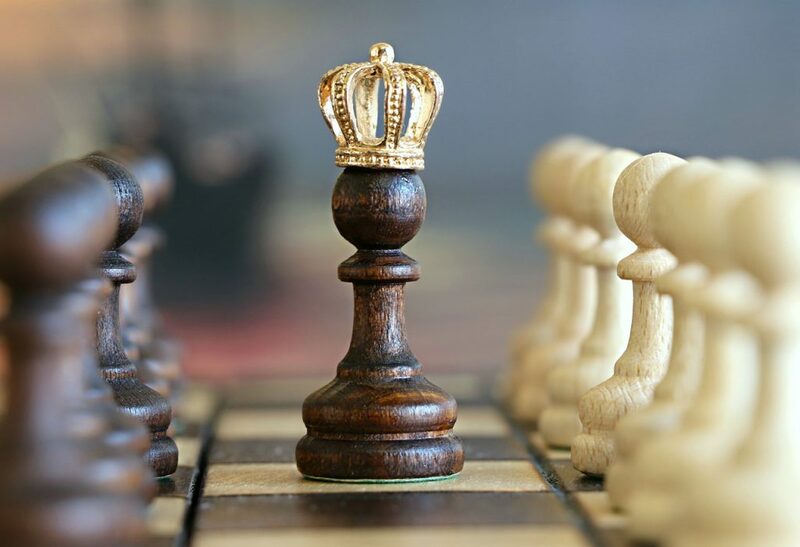 Some people swear by business profiles and all of the good things they can accomplish for your business, while others claim they aren’t worth all of the hype. So, let’s take opinion out of it and just look at the facts and features to help you make your most informed decision. Let’s skip the Instagram Business Profile cons and jump right into the good stuff! 1. You can leverage your Instagram bio. Any marketer knows that you’re pretty limited on space when it comes to your Instagram bio. With a standard account, you only have 150 characters and the option to include one clickable link—meaning it can be tough to determine just what you should include in that precious real estate (as well as what you should cut!). But, with an Instagram business account, you have a little more wiggle room to really maximize the effectiveness of your profile. In addition to the contact buttons we included above, you can also include a button for followers to get directions to your business (if applicable) as well as your business address. It might not seem like much. But, when you’re already stressed trying to figure out how to include all of your need-to-know information in your Instagram bio, having those extra features certainly helps. And of course, you also get a clickable link in your profile that you can connect to a website of your choice. While most businesses use this to link to their homepage, taking advantage of the Sked (formerly Schedugram) link-in-bio feature might be more beneficial. What it does is set up a branded redirect URL as your profile link, which can be pointed towards any web page you like when you publish a post. It makes it really simple to send people to different landing pages, blog posts, and promotional offers without having to change your profile link. Go into your “Manage Accounts” dashboard and select “Account Settings” for the chosen Instagram account. Then, turn on “Enable account Profile URL”. Next, enter the URL of the website that you want to be your default URL (for most people, your homepage would be the best option), then scroll down to the bottom of the window and click ‘save settings’. Next, look at the 3 free redirect URLs you’ve been provided with (I’ve put an orange box around the ones for this account in the screenshot below). Yours will be based on your Instagram username (i.e. https://your-username.click2.co). You’ll notice below the box that you also have the option to create a custom redirect URL (blue arrow) if you prefer a different format to the free ones provided. 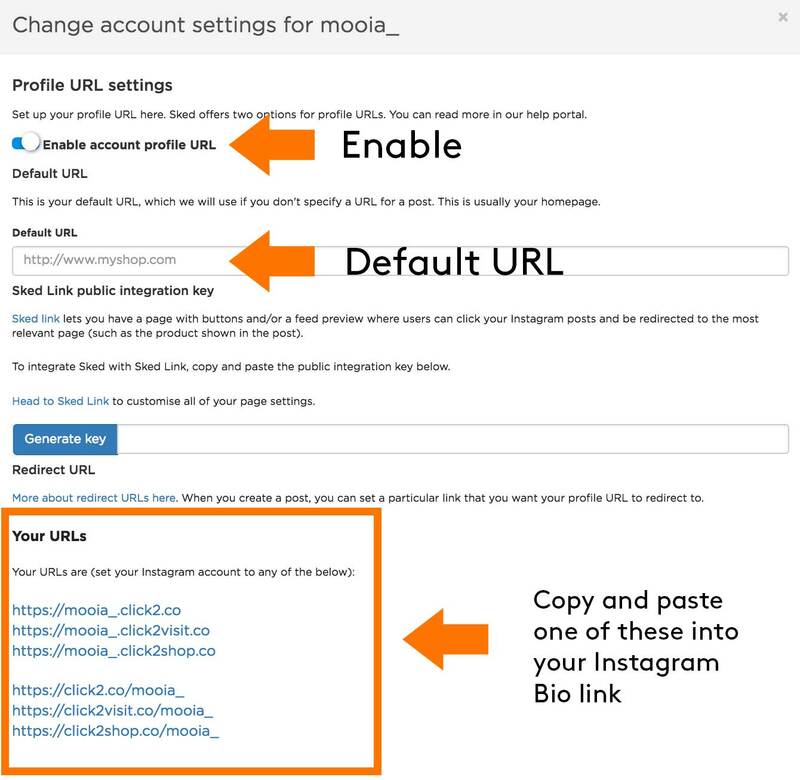 Choose whichever one of the 3 redirect URLs you prefer (or a custom redirect URL, if you created one) and copy-paste it into your Instagram profile as the website you want to link to. Now, you’ll be able to keep this same, branded link in your profile and use it to send people to any webpage you like when you publish a post to Instagram using Sked. All you have to do is add the URL of the website, landing page, blog post etc. you want to send them to in the URL box when you’re creating a post (see green arrow below). 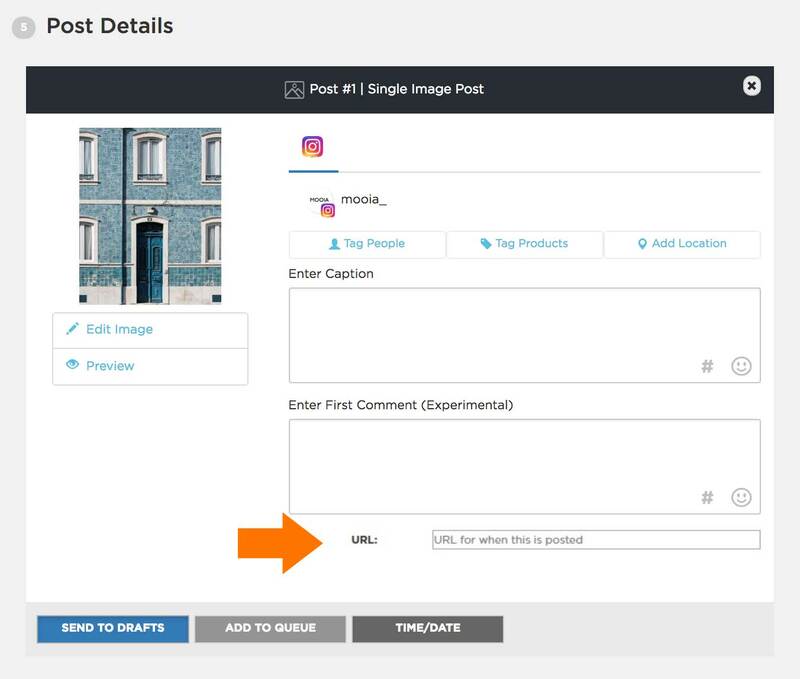 Then, put the words link in profile in the caption of your Instagram post, and when someone clicks on your profile link, they’ll be automatically redirected to the webpage you assigned when you created your post. 2. You can run ads and boost your brand awareness. 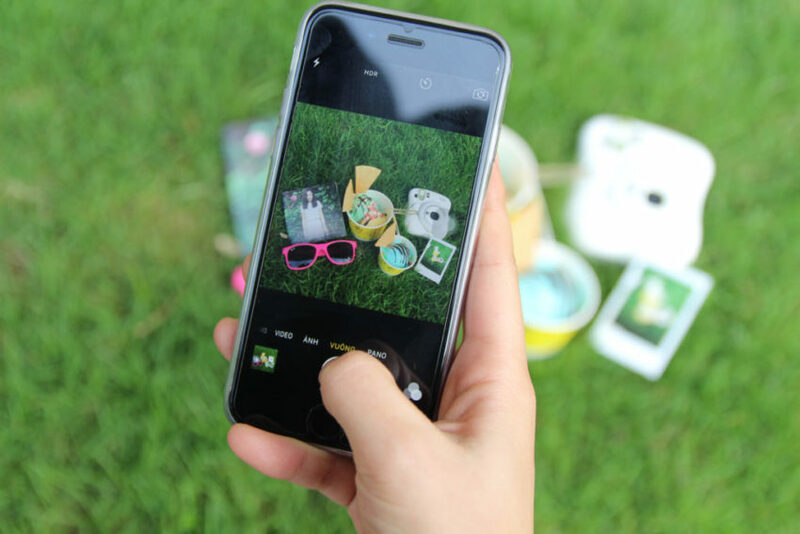 When it comes to Instagram for business, advertising can be undoubtedly effective. Just take a look back at the first Instagram ad from Michael Kors, for example. That ad received four times the number of likes when compared with a non-promoted post from the brand. By switching over to an Instagram business account, you have the option to run all sorts of ads and drive potential customers and followers to your page. Having a business account also gives you the option to promote specific posts from directly within the app. 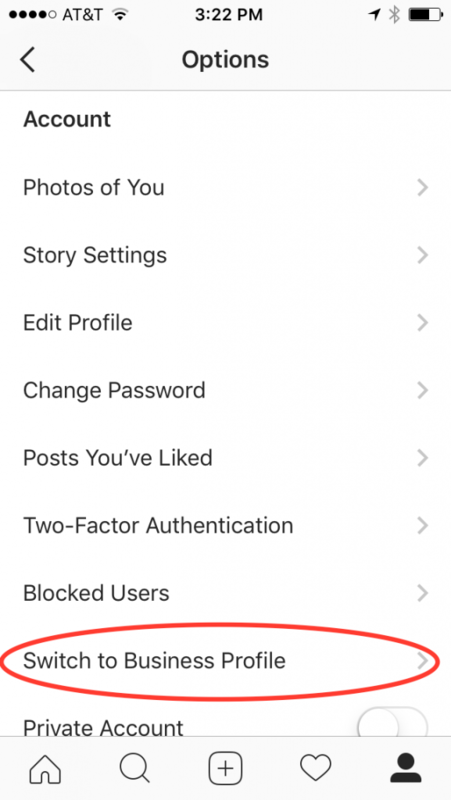 Another feature you might’ve seen that’s currently only available to business accounts is the option to add links to your Instagram stories. As a feature that was first only rolled out to verified accounts, it’s now been expanded to include business profiles with more than 10,000 followers. Including links with your stories can be incredibly effective. In fact, Instagram story links get 15-25% swipe-through rates for publishers and brands. 3. You get insights into your followers. Insights and analytics are some other helpful features you can enjoy if you convert to an Instagram business profile. While the analytics are somewhat simplistic and basic, they still provide a glimpse into who your followers are and what they’re looking for. Again, some marketers have complained that the platform doesn’t offer tons of advanced analytics. But, being able to take a peek at those stats directly within the app is still helpful when crafting your posts! For Sked users, the link-in-bio feature also lets you track every click your profile link gets from each post. It’s a great way to figure out what types of content work best for your audience. 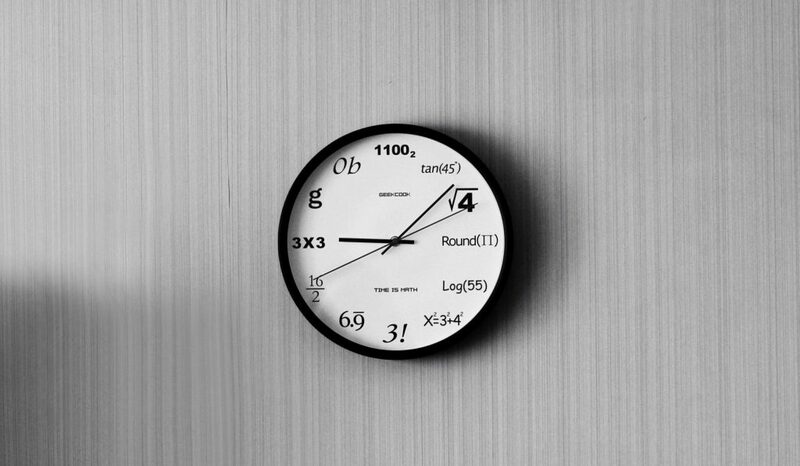 You can find out more about Sked’s analytics here. There are quite a few benefits associated with making the change to an Instagram business profile. On the flipside, there are really very few Instagram Business Profile cons, and by few, we mean only one! But, it is a big one that’s deserving of your serious consideration before moving forward with any sort of switch. You might hurt your engagement. Instagram typically remains pretty tight-lipped about all that’s involved with their algorithm. But, if the platform follows in the footsteps of the parent company, Facebook, then we know one thing for certain: They want people to pay for ads. It’s where they make their money. Think about it this way. When you switch to a business profile on Instagram, you’re signaling to the platform that you are indeed a business eager to get your brand and products out in front of prospective customers. That act alone labels you as one of Instagram’s target customers—a business that would be ripe for some advertising. As a result, Instagram might very well make some adjustments that mean that less and less of your followers see your posts in their feeds. When your engagement numbers start to dip? You’ll be far more inclined to foot the bill for some advertising. Plus, as more and more brands are present on social networks, the algorithms almost always assume that users will value a post from a friend or individual more than a sales message from a brand—which makes it that much tougher to get your content seen. While it’s tough to find any specific statistics that speak to the engagement nosedive that brands experience after making the switch, many suspect that changing over to a business profile can have a negative impact. From analytics to the option to run ads, there are plenty of Instagram business profile cons and pros associated with changing your brand’s account over to a business one. However, the potential lack of engagement is also something worth thinking over. If you can make up for the one Instagram business profile cons, you’ll be on your way to reaping some great advantages! Ultimately, it all comes down to personal preference. Think about your own brand, weigh these pros and cons, and then figure out what would work best for your account moving forward. Remember, there isn’t one right answer! Now that you know all the Instagram business profile cons and pro, why not start carving out hours in your social media workflow, by signing up for Sked’s 7-day trial. Our all-in-one Instagram scheduler allows you to automatically post images, carousels, Stories, videos and more. Tag locations, users and products and manage all your hashtags in one place to save 5+ hours every week. I do not have a business account for my business on Instagram. If I switch over, will I have add all my contacts again?